by Cynthia Eden, Tyler Anne Snell, Webb D./Black R.
Secrets from their pasts threaten Elizabeth Snow and Mac McGuire—as much as the killer who seems to know their every move. Can they trust each other again? Or will a shocking truth prove fatal? When someone tries to kill security expert Sophia Leone, she's rescued by her husband, Frank—an army general she thought died a year ago. Now Sophia must trust her life to the man she married…the man she never stopped loving. 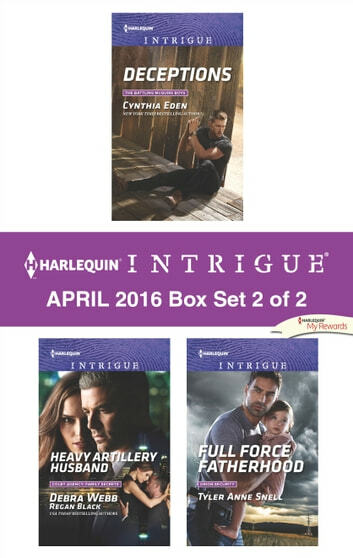 Look for Harlequin Intrigue's April 2016 Box set 1 of 2, filled with even more edge-of-your seat romantic suspense! by Cynthia Eden,Tyler Anne Snell,Webb D./Black R.